Sea and Wood: Pudsey's costing me an arm and a leg...! Pudsey's costing me an arm and a leg...! Nah, not really. 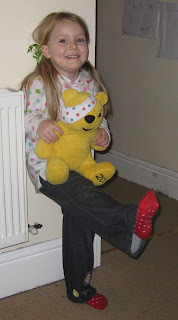 But when you actually have a child it's surprising how much it racks up around Children In Need day! Today's little shenanigans have been a far cry from the time me and a mate dressed up in hotpants and bunches, and trundled round the uni engineering labs (and at a science uni, that's a LOT of labs) shaking a bucket and tolerating the leering in the name of charity, anyway. Which is a relief, given that I'm 33, not 19 and certainly don't have that figure any more! Here's K, showing off her bear, spotty top, ribbons and socks for "dress spotty day" at preschool. They've been baking all week, so we have plenty of fairy cakes (and it's been rather nice picking her up each day as the building has smelled lovely!). Some pretty Dorset Button hairclips for K, donated by Big Blue Bed - she's asked for these in purple and is terribly excited! And since I can never resist a) treating myself and b) a pretty bracelet, this is for me and was donated by Snow Queen. 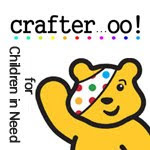 Go on and see what there is to buy - there's a great range of lovely things from crafters all around the UK - including me!